Yesterday I attended a "virtual ribbon cutting" (it takes a snow cat to reach the actual tower and the wind chill factor as about zero degrees) for Central Colorado Telecom, the Chaffee County version of Crestone Telecom, LLC at the annual Chaffee County Economic Development Corporation awards banquet. The event was hosted by Mt Princeton Hot Springs Resort which has suffered from pathetic internet and cellular services. What is significant about this event is that Crestone Telecom has been in operation for about 9 months and is almost cash flow positive. Through multiple invitations (and local investors plus a loan from the community bank) from anchors in Chaffee County (just north of Crestone over Poncha Pass), Crestone Telecom launched Central Colorado Telecom and has now completed microwave backhaul of one Gbps + into the county reaching anchors such as Monarch Ski Resort, mt Princeton hot Springs, Heart of the Rockies Medical Center, towns of Salida and Buena Vista. Community leaders gave praise to founder Ralph Abrams for taking the initiative. Tim Kunkleman – Colorado regulatory director for CenturyLink. Pete Kirchhof – Colorado Telecommunications Association. Dan Reno – Hughes Net. Melissa Shannon – Optimum Government and Public Affairs. Aaron Bailey – Xiocom Wireless/CityNet. During the panel, Pat Swonger stood to speak briefly on behalf of EAGLE-Net. Unfortunately, many of the opinions expressed by some of the panelists got my dander up and my notes are less than effective. To summarize, the general opinion in the room seems to be one that favors changing the regulation or the subsidization models for the status quo model of private ownership of the natural monopoly element. The status quo model – with various regulatory regimes and subsidization schemes – will not serve to resolve the broadband problem that pervades the United States and has left rural Colorado isolated from the 21st Century economy. Colorado does not need new regulatory schemes to force those networks that are subsidized with tax dollars to provide service. Colorado, as well as states and municipalities across the nation, needs to recognize that telecommunications infrastructure is a natural monopoly and should be treated as such. We should build open access infrastructure as a public utility and allow multiple service providers to offer service. Doing so significantly reduces the need for regulation or subsidization of private companies with public money. Interestingly, the provider panel does not include state network owners. Mr. Kunkleman argued that municipal entry is simply overbuilding and wasting money. He argues that we should pay CenturyLink to close the cost gap. Unfortunately, this method has been unsatisfactorily tried with both MNT and Colorado Tele-Health network. The second session was presented by Brian Shepherd and Megan Chadwick of OIT. The map was started through the ARRA grant process. The map is compiled from data provided by the various service providers in the state. Most of the offices efforts are put into collecting and validating data. The office does collect speed test data and other performance measures. These performance measures are used, in part, to validate service provider provided data. Mr. Shepherd answered a question about what value this map data has by talking about the fact that broadband is an unregulated service. The overall question of today is, “What is the role of government?” Most of the conversation revolved around government regulating or subsidizing incumbent network owners. Some of the conversation touched on state provided infrastructure (in particular, dig once policies and the Arizona digital highway law). It focuses on census blocks – these geographic blocks do not reflect real service availability. It does not survey backbone or middle mile infrastructure. There is no mechanism on the state’s site for reporting unserved areas. FremontConnect held their regular meeting this past week in Canon City. services that are: "redundant, abundant and affordable"
In its 2011 session, the Kansas legislature passed HB 2309 which called for an audit of the state's research and education network, Kan-Ed. Like many such networks administered by state governments (in Colorado, its the Colorado State Network, in Oklahoma its OneNet, etc, etc), it consists largely of T1s (1.54 Mbps up and down) from the telephone company. The upshot of the audit is to determine if the network in its current configuration, offerings, speeds, etc is adequate to meet the needs of the state's public schools and institutions of higher learning in a 21st century global economy. I have no idea what the audit might turn up, but I salute the Kansas legislature for asking the right questions. Arizona provides a shining example of how Colorado could aggregate existing resources to improve the broadband environment for rural and remote communities across the state. As the demand for digital Internet speed increases exponentially, many of Arizona’s rural residents and businesses found they either did not have high capacity digital services available at all, or the available services did not provide sufficient capacity to support new video intensive Internet services such as eLearning, Tele-Health, Telework and IPTV, etc. These shortcomings have been limiting factors in the availability of jobs, educational opportunities, public safety and healthcare services in such areas. The passing of Senate Bill 1402 in 2012 allows for the spread of significantly higher-speed broadband access to citizens statewide, accelerating economic growth, education, public safety, healthcare, and digital government in Arizona. Specifically, the bill expands existing rules governing Arizona Department of Transportation’s (ADOT) management of state rights of way (ROW) to include transportation-of–information as well as vehicles. When funding is provided to ADOT, from a fund to be managed by the Digital Arizona Project, ADOT will be requested to bury multiple empty fiber-optic conduits along specified state highways-using existing ROW wherever possible. These multiple separate conduits will be leased to broadband providers by the Project on a cost recovery basis. Providers must contract to install fiber before conduits are constructed. The outcome of the Project will be streamlined access to the ROW at significantly lower costs to providers for constructing long distance digital capacity to reach rural communities. These lowered costs are expected to encourage new investments by provider’s thereby accelerating and improving availability of high-capacity digital services in poorly served areas of Arizona. It is expected to take a number of years to fully implement this program throughout the rural areas of the state. I spent most of this past Friday in Vail getting the cook’s tour of the reinvigorated municipal wireless network. I was most impressed! Lets go back a few years when municipal Wi-Fi appeared to be the wave of the future in terms of ubiquitous internet access. Since then, no fewer than 19 state legislatures (including Colorado) have banned municipal internet anything much less Wi-Fi or broadband. Fast forward to 2012 and Town of Vail in partnership with the ski corporation, Aspen Wireless and Crown Castle International has reconstructed a form of municipal wireless that underlines the “Vail experience”. That is, not only does the visitor’s Netflix work, so do all the apps on the iPhone. Contrast that with some other ski towns where the telecommunications infrastructure fails to meet the demands of a seasonal influx of urbanites who expect a digital experience on a par with their home cities (think Lower Manhattan or the Bay area). Fail to meet those expectations and the high margin clientele will not return. Before being spun off to CenturyLink, the Vail Wi-Fi network had 18 nodes of which only 1 survives. The new network not only offers ubiquitous, free Wi-Fi, it also has a cellular distributed antenna system (DAS) to ensure cell coverage everywhere in the Vail Village. This DAS is somewhat akin to an open access network where any cellular provider that wishes to participate, makes a small contribution in hardware to ensure their subscribers are cared for. 1. Aggregate experience: partners include Crown Castle (one of top 3 tower companies in the world); Town of Vail (they’ve been here before and have more sales tax revenue than you know who, not to mention a real smart IT manager, also the savings in moving the town telecom off wireline and onto wireless) Aspen Wireless (they’ve been in the business for over a decade), Vail Resorts (the “Vail experience”) and the Big 5 cellular providers. 2. Assess the broadband (wireless) environment: would big names like this be doing this if there wasn’t a clear need? 3. Assess and aggregate demand: would big names like this be making this investment if there wasn’t a clear business case? 5. Adapt for sustainability: given the deep-pocketed partners and the fact that these players came back to the muni wireless models years after CenturyLink took it over and killed off the network, its plain to see the community commitment (yes, a publicly traded company like Vail Resorts is a member of our rural Rocky Mountain community!) to the network points to long term sustainability. I expect the other ski towns to read, weep and make plans for their muni wireless networks soon. Frank, here in Region 9 we are also relatively new as a group but have cemented a diverse group and are starting to make some progress. 1. We are now attempting to validate the Colorado Broadband map of assets in our region to include wireline, wireless, and mobile broadband. We believe that, in order to identify underserved areas of our region, we must know what we have/don't have and where our current ISPs have submitted incorrect or exaggerated coverage and available speeds. 2. Via the City of Durango and their license agreement with Mobile Pulse, most of our team is contributing to a study of mobile data usage across our region. This is most useful on many fronts and we are fortunate to have usage across the incumbents. This first item above will keep us very busy as a group for a while.... Hope this was informative and useful. Has any one heard anything about new legislation? I have not. Last year we heard a lot about SB-157 which would have channeled High Cost Fund $ to broadband infrastructure. There is frequent talk of "tweaking" SB-152 to allow more public sector involvement in telecom services especially broadband. However, I have not heard of any legislator pushing any legislation. Let us know if you hear anything. Or, what initiatives can we be pushing? 1. FremontConnect This team is making great progress. They have identified a carrier neutral location that is located on an existing fiber ring around Canon City. In addition, a redundant fiber connection to the outside world is planned. 2. ChaffeeConnect: One year after the first meetings, we are happy to report that Chaffee Telecom, LLC is busy constructing a redundant middle mile (Gbps+ microwave) into the county connecting Poncha Springs, Salida, Mt Princeton Hotsprings, Monarch Ski Mountain and Buena Vista. In addition, very fast (10 Mbps+) fixed wireless will be available in those markets as well. 3. CusterConnect: Six months after their first meeting this hard-charging team is exploring an aerial fiber solution to provide Westcliffe and surrounding areas with a redundant, abundant and affordable middle mile solution. 4. NW CO Broadband Cooperative: Articles of incorporation, by-laws, etc are ready to go on this cutting edge broadband team. Carrier neutral locations are planned for both Steamboat Springs and Craig. Grand County is plugged into the planning and is exploring a needs assessment. 5. San Luis Valley Broadband Cooperative: Saguache county now has a new fixed wireless service provider, Crestone Telecom, LLC building out county-wide including Center, Saguache, Villa Grove, Moffat, and Crestone. A redundant fiber link over La Veta Pass is complete (thanks GoJade!). A carrier neutral location is planned for Alamosa. These are just the high points. I invite others to report in. Many communities throughout Colorado recognize a need to improve telecommunications capabilities, capacity, reliability, and choice. Much like the rail systems of the late 1800’s, today’s advanced communications infrastructures represent a means by which communities may participate in, or find themselves left out of, the global economy. Many communities are discovering that critical telecommunications needs in their business and residential markets are going unmet. Incumbent network owners consume limited public easement space with monopoly controlled networks. Quarterly reporting requirements encourage these private incumbent network owners to maximize the appearance of short-term profits by delaying infrastructure upgrades and maintaining pricing models based on bandwidth scarcity. The financial market forces driving private incumbent network capital investment has dampened broadband availability across the nation and in, in particular, in rural areas. Nationally, the Information and Technology Innovation Foundation has ranked the United States fifteenth out of the thirty advanced nations studied in a comparison of the quality of broadband connections based on the percentage of households with access, the speed of the connections, and costs. Based on speed alone, the US ranks even lower – at 25th according to a survey by Speed Matters. 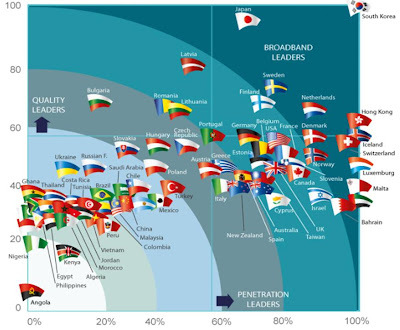 “Figure 1 – Global Broadband Quality and Penetration Leaders” shows that while the US lags behind other developed countries in broadband measures of both quality and penetration. In “The Global Competitiveness Report 2011-2012,” the World Economic Forum ranked the US 18th in Internet users/100 population, 18th in broadband Internet subscriptions/100 population and 26th in Internet bandwidth measured as kb/s/capita (p 363). 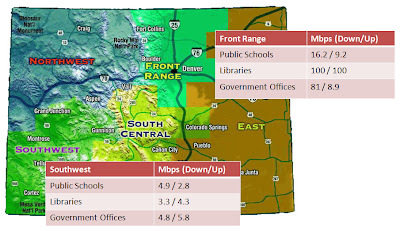 In rural areas of the country, in rural Colorado, the quality of broadband connections and available speeds is significantly worse than in urban areas. Recent ad hoc studies conducted by the Colorado Broadband Data and Development Program have demonstrated that bandwidth to community anchor institutions in the Denver metropolitan area is significantly higher than in rural southwestern Colorado, as depicted in “Figure 2 – Colorado CAI Bandwidth Comparisons”. The state study also showed significant per Mbps cost differences between the Denver metropolitan area and southwest Colorado. Reported costs for T1 like services in the Denver metropolitan area average $167 per month per Mbps. In southwest Colorado, reported costs for these same services average $438 per month per Mbps. For larger scale purchases, monthly cost per Mbps in the Denver metropolitan area can be as low as $1.25. The lowest reported bulk purchase price in southwest Colorado was $12 per month per Mbps. In sum, bandwidth is less available and more costly in southwest Colorado than in Denver and more costly and less available in the US than in many other advanced countries. · Closing the digital divide making service reasonably available to all citizens. Unfortunately, many Colorado communities are faced with barriers that seem insurmountable when looking to resolve common telecommunications issues. Large and small communities throughout the state are unclear of the limitations placed on them by Colorado’s preemptive telecommunications laws, they lack clear success stories with successful business plans to model themselves after, and they need to find the capital to cover what can appear to a small community to be an overwhelming implementation cost. These posts should not only define the broadband problem Colorado's rural communities face but should also pose solutions. Atkinson, Robert D., Daniel K. Correa and Julie A. Hedlund (May 2008). “Explaining International Broadband Leadership.” The Information Technology and Innovation Foundation. Retrieved 12 September 2011 from http://www.itif.org/files/ExplainingBBLeadership.pdf. Speed Matters (November 2010). “2010 – A Report on Internet Speeds in All 50 States.” Communications Workers of America; Washington DC. Retrieved 24 January 2012 from http://cwa.3cdn.net/299ed94e144d5adeb1_mlblqoxe9.pdf. “Figure 2 – Global Broadband Quality and Penetration Leaders” and the data supporting it come from the Said Business School’s (University of Oxford) “Third Annual Broadband Study Shows Global Broadband Quality Improves by 24% in One Year” published in 2010. Said Business School, University of Oxford (1 October 2009). “Global Broadband Quality Study Shows Progress, Highlights Broadband Quality Gap: Broadband Quality Improves around the World Despite Economic Downturn.” University of Oxford; London. Retrieved 24 Feb 2012 from http://www.sbs.ox.ac.uk/newsandevents/Documents/BQS%202009%20final.doc. What are the next steps for Colorado Rural Broadband? 1. The FCC deregulated broadband, which, were it regulated, would be a utility as it would be subject to the Common Carriage obligations under the 1934 Communications Act. This would mean, among other things, that (a) it would be subject to universal service; (b) providers would be subject to carrier of last resort obligations; (c) there would have to be some form of price control (and we have precedent for forward-looking cost-based pricing, which is the most reasonable approach from a public policy perspective); (d) anyone could attach any device they like to any network - wireless or wireline or cable - rather than being forced into buying device, software and services from the same vertically integrated mega-provider; and (e) would likely do a great deal of good for opening up the worst levels of market concentration we've seen in telecommunications in this country since 1912. 2. Against this backdrop the FCC is attempting piecemeal deregulation of certain segments of the industry while gutting traditional universal service. This is pushed very hard by AT&T (who is quietly abandoning landline), Verizon (who has sold off most of its rural/expensive landline properties) and Comcast, Cox, BrightHouse (who just sold off some of the most desirable spectrum in the country to AT&T and Verizon in exchange for tacit agreement that the AT&T and Verizon would no longer compete in landline markets) all of whom hate paying into a fund they see going primarily to the traditional incumbent landline carriers, who, like so many others, absolutely refuse to deploy fiber optic in the places where it is most needed despite being given enormous sums of taxpayer money. 3. Overall, landline carriers are dying as a result of severely unbalanced regulation and subsidy system that let them harvest enormous direct and indirect subsides for years without having to invest and upgrade their network plant. 4. Some smaller carriers, however, have done a pretty good job of upgrading their plant and running fiber optic. 5. This leaves most rural communities in a bad spot; there are fewer and fewer funds available to upgrade and the subsidy systems are broken. What this means is that we need real vision in this state. Colorado is the nation's 8th largest state and one of the most diverse in terms of geography, climate, and population densities. The Internet enables location-independent workers, particularly where reasonably priced, robust and redundant carrier-grade fiber optic facilities are available. It is the very engine of economic growth and a critical input into any economy no different than road, running water, sanitation, electricity and public safety. 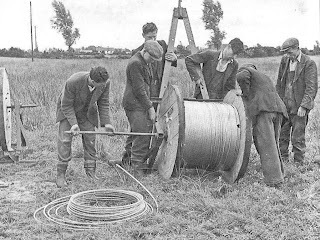 Given how strong the market concentration is right now, the worst thing that could happen would be for government funded entities to displace the remaining few communities and community-based providers who have upgraded their networks to fiber optic. If this state can understand how we got to where we are while embracing a vision of investing in communications as a infrastructure rather than a business, then the government would be in a position of creating opportunities for existing carriers while also creating opportunities for community-centric economic development in ways that would serve as a model for the entire nation. I look forward to continuing to support the carriers, communities and visionary public servants of this great state who are unafraid of the hard facts and have the courage and creativity to forge ahead with new solutions on new terms using new thinking. The only limits are our collective creativity and courage. As a result, I see nothing but upside for Colorado. I hope to use this blog as a means for our movement to communicate across communities and drive broadband environment improvement across this great state of ours. If you don't have a copy of the book yet, drop me a line so I can forward an ebook to you.